Dr. med. Eckardt Johanning, M.D., M.Sc. offers a wide range of professional medical clinical services, from medical examinations and treatments, to consulting services related to the vital connection between work, environment, and health. Contact us for a consultation and let us know how we can assist you and improve your health. 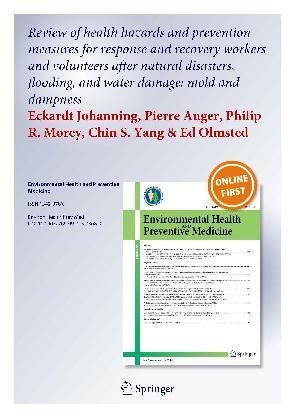 Health problems and illnesses encountered by unprotected workers, first-responders, home-owners, and volunteers in recovery and restoration of moldy indoor environments after hurricanes, typhoons, tropical storms, and flooding damage are a growing concern for healthcare providers and disaster medicine throughout the world. 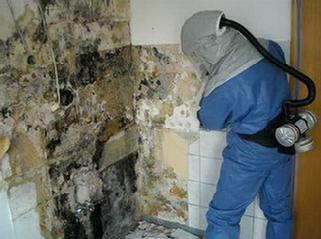 Damp building materials, particularly cellulose-containing substrates, are prone to fungal (mold) and bacterial infestation. During remediation and demolition work, the airborne concentrations of such microbes and their byproducts can rise significantly and result in an exposure risk. Symptoms reported by unprotected workers and volunteers may relate to reactions of the airways, skin, mucous membranes, or internal organs. Dampness-related fungi are primarily associated with allergies, respiratory symptoms or diseases such as dermatitis, rhinosinusitis, bronchitis, and asthma, as well as changes of the immunological system. Association of Occupational and Environmental Clinics, a non-profit organization.